The most widely known form of digital imaging of the human body is X-ray. This procedure issues minimal doses of radiation as x-rays in a targeted area to detect an abnormality or fracture. X-rays are a safe and painless procedure that lasts 10-20 minutes on average, and allows the radiologist to analyze bones and tissues.X-ray are most commonly used to examine the chest which can be used to identify lung diseases such as pneumonia or lung cancer, and the abdomen, which can detect intestinal obstruction. X-rays may also be used to detect pathology such as gallstones or kidney stones. Traditional X-rays are less useful when imaging soft tissues such as the brain or muscle. For all X-rays: the patient should refrain from wearing clothing with metallic jewelry and ornaments such as hair clips, under wire bras, zippers and buttons. The patient must continue with their regular medication regimen, if any. For Upper GI Track (UGI),Barium Swallow, Small Bowel: Patients should not drink or eat anything after midnight the night before the test. What should I expect during the exam? For all X-rays: the patient will have to lay or stand and remain still during the exam while following specific breathing instructions from the technologist, if any. The patient may also be asked to remove any metal in the area being examined. For Upper GI Track (UGI), Barium Swallow, Small Bowel: the patient must drink an oral contrast solution that will be provided by the attending technologist at the time of the procedure.What should I expect after the exam? For Upper GI Track (UGI), Barium Swallow, Small Bowel: The patient should drink plenty of water after the test. 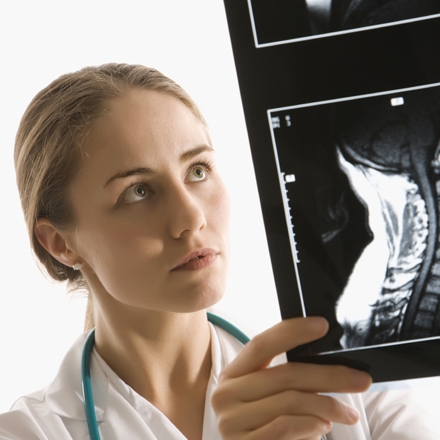 All of our diagnostic examinations are interpreted by Board-Certified Radiologists. The results of your X-ray will be sent to your referring physician as soon as they are interpreted. It is the patients´ responsibility to contact their referring physician to discuss the results of their examination and ask for further recommendations.